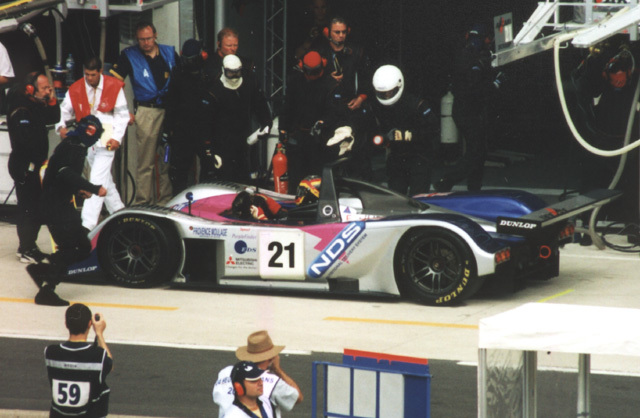 2002 saw the largest ever Tourist assault upon La Sarthe. With 14 of us signed up, we knew that life was going to be just a little bit cramped in the 15-seater mini-bus which Ian had once again borrowed for our weekend's transport! The nucleus of our 2001 team remained unchanged, with Ian, Martin, Alan, Robert, Chris, Howard and myself returning in 2002. 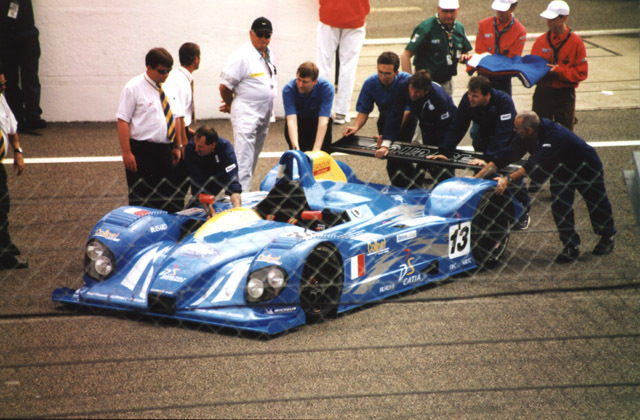 Joining us this year were Nick (first visit since 1996), Richard (1994), Jeff (2000) and John (whose last trip to Le Mans was in the year of my first - 1986). Joining us were three new Tourists, Mike, David and Peter. As in most years, the trip began with the rendezvous at the home of Chief Tourist Ian, where I was able to distribute the now famous self-destructing Aysedasi's Le Mans t-shirts to all of the team members! An uneventful crossing saw us soon on our way into France heading for our evening destination of Le Grand Lucé, where we would be spending Friday and Saturday night at Le Hotel Restaurant Le Cheval Blanc. Unfortunately, due to a later start to the weekend than usual, there was no Friday pits walkabout for us this year. (And, unfortunately, not a lot of early photos either. I was alternating between still and video but on Saturday at the circuit, I managed to ruin my first reel of film - hence no pics at all until during the pre-race festivities). On the Friday evening we had another excellent meal at Le Belinois before touring around the area, watching the fireworks from the campsites and so on. 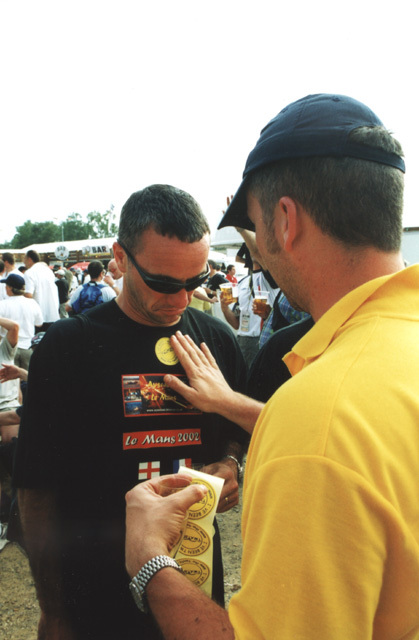 On raceday, my prime concern was to locate Fab, my French "correspondent" and after the Tourists had entered the circuit and headed off in various directions, I made my way over to the grandstands to find him. Even though Fab and I had known each other for some time, this was to be our first meeting. Thanks to Fab's kind generosity I had a seat in the grandstand with him for the pre-race festivities and the start of the great race. The pre-race atmosphere was as good as ever this year and the big bonus was the marvelous weather. 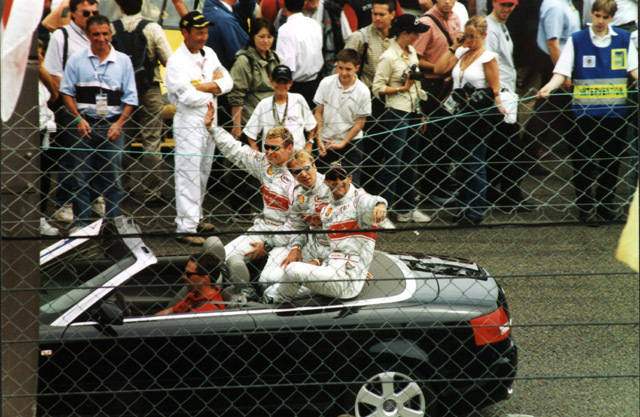 The drivers' parade is always one of my favourite parts of the pre-race action, but my photographs seemed to be spoiled more than ever this year by the angle of the debris fencing from my seat in the grandstand. 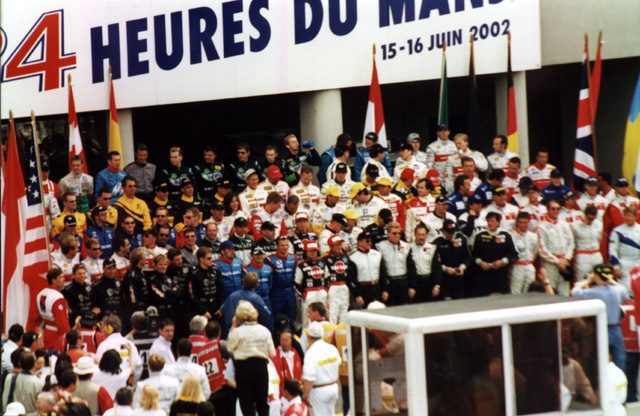 Before long, the grid was cleared of the "pretty people" and the 2002 Vingt-Quatre Heures du Mans was under way. 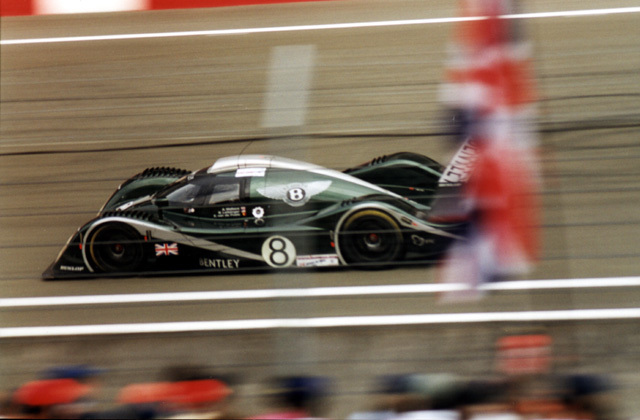 There was obviously a lot of support for the singleton Bentley this year, but even from the opening few laps, it was pretty obvious that the Audis were going to run away and hide (although a puncture for the No. 3 car on the "green flag" lap did give us all false hope for a while!). 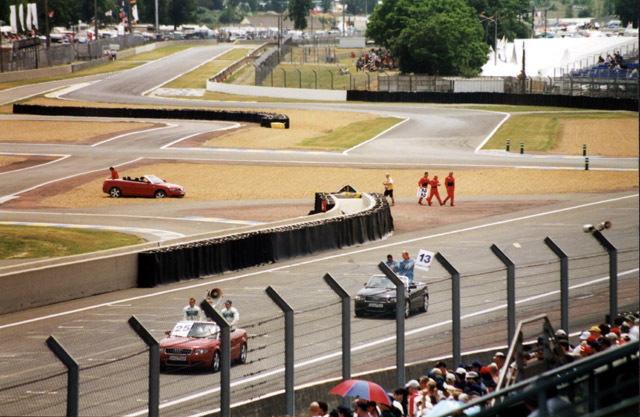 But even if we knew in our hearts that this was going to turn into another Audi rout, we were at Le Mans once again, sitting in the sunshine watching the world's greatest motor race. 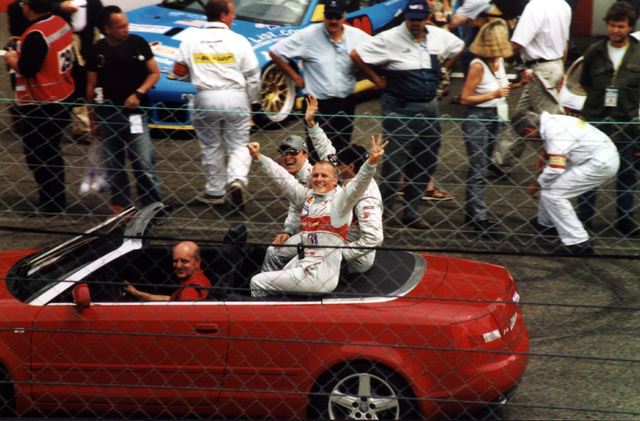 Even a foregone conclusion on the track couldn't take that away! The first casualty of the race (as some predicted) was the Autoexe of Terada, Downing and Fergus, which managed only 5 laps. 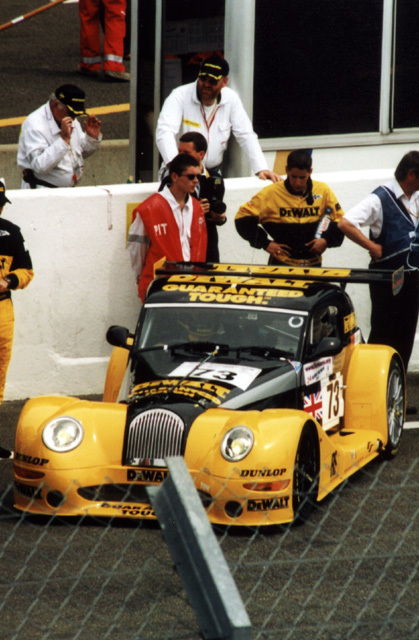 Another car which had problems was the Ascari of Lupberger, Collins and Bell which was immediately retired after a huge accident after it had completed 17 tours. Before long it was time for me to say a temporary farewell to Fab and to wander off in search of the rest of the Tourists. As usual, we had fixed several possible rendezvous points and one of those (inevitably!) was the champagne stall on the inside of the circuit, at the top of the Village. 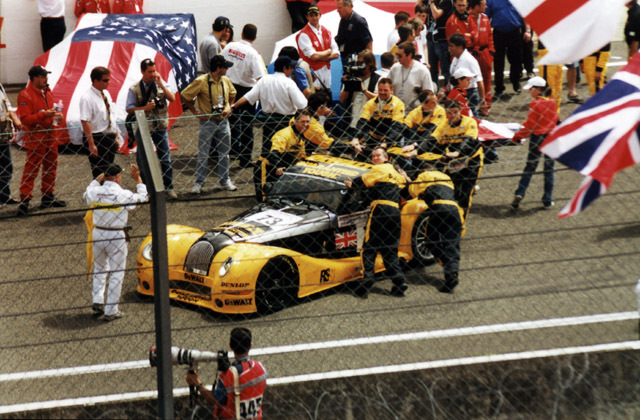 Rather like the Grand Marnier crepe stall, the champagne "tent" is one of the favourite meeting places for the Brits at Le Mans, and they certainly know how to enjoy their champagne! 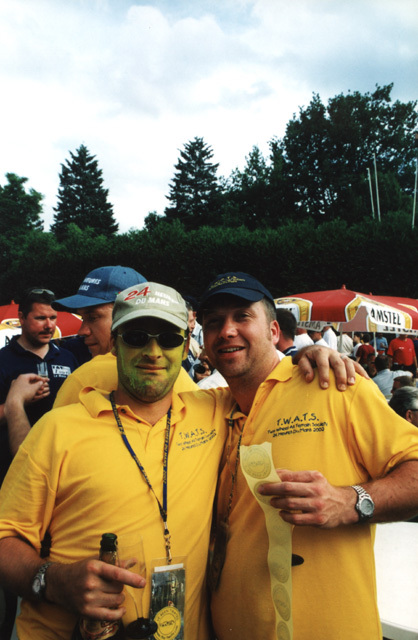 I met up with the other Tourists there as I expected, but I also met some other yellow-hued Le Mans fans, whose banners I had seen in the crowd (both this year and in earlier years), but who I had never had the chance to chat with before. It was, of course, the T.W.A.T.S.! 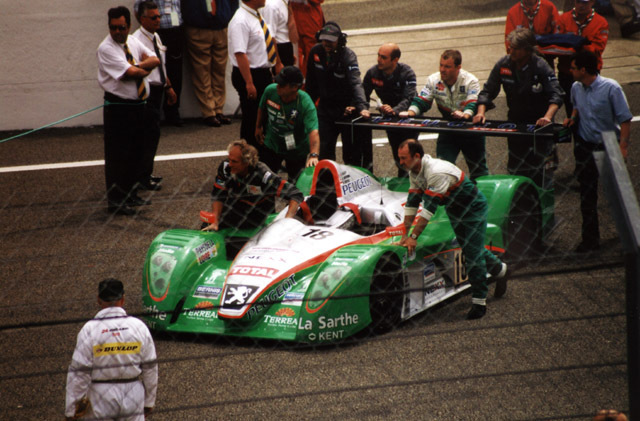 As there are so many groups of Le Mans fans who either travel to Le Mans together or meet up at La Sarthe each year, the use of "corporate" colour-schemes has become quite popular. Even the Tourists were be-decked in my 24 Hour t-shirts (so dubbed as they very nearly lasted 24 hours from the time I made them!). As you can imagine, as with all of the rest of the Tourists I was well and truly twated by the various members of the T.W.A.T.S. who were certainly enjoying the champagne (and any other alcohol they could lay their hands on)! I guess by now the race was between 3 and 4 hours old and, like all good Tourists I was beginning to think of my stomach. So it was time to find our way back to the minibus and return to Le Cheval Blanc at Le Grand Lucé for a meal.